Below is our review of the Asus Zenbook UX32A, a 13.3" laptop, featuring 4GB RAM, 500GB hard drive and Windows 8. So you're looking to buy a laptop, and require something light enough to travel with but powerful enough to be functional and practical. The Asus Zenbook range could be the solution. In this review we look at the UX32A, a 13.3" ultrabook, offering a decent amount of power from within it's small dimensions. The first thing you notice about the Zenbook UX32A is the beautiful brushed aluminum shell - this laptop oozes class. It weighs very little - just 1.45kg, and as a result is remarkably thin - just under 2cm in depth. Despite this, it feels well built, and as though it will put up with the general wear and tear associated with day to day usage. There are slight downsides with the small overall size of this notebook - it is slightly restricted in terms of connectivity. It features a headphone / microphone combination, 3 x USB 3.0 ports, HDMI and VGA, as well as a card reader, but no DVD drive and no Ethernet connection. The notebook is supposed to come with a USB / Ethernet adaptor, but we have read reports of this not being included with some orders. The display is a 13.3" LED backlit TFT LCD, operating at a default resolution of 1366 by 768 pixels, which offers an exceptional picture - all of our testers loved this, with the graphics being beautifully crisp and colours being both vibrant and represented accurately. The 500GB hard drive offers a substantial amount of storage, which is backed up by a further 24GB in the form of an inbuilt SSD. This, when combined with the impressive Intel Core i5 3317U 2.6GHz Processor and 4GB RAM, means that this laptop flies - which given the lightness and overall size of this notebook is even more impressive. Multi tasking was handled with ease, and it handled multiple applications with ease. The operating system, as you might expect with a high end laptop, is the new Windows 8, which ran well during our test period. So overall what did we make of the Asus Zenbook UX32A, and who is it aimed at? If you have the money to spend, and are after an incredibly stylish, lightweight, yet still powerful laptop, then it is ideal for commuting or traveling with. It looks great, performs well, and offers an impressive amount of computing power for both it's size and the price tag. Pros: Incredibly light and portable, looks stunning, perfectly functional. Cons: No DVD drive - this keeps both the weight and size down however. A beautiful ultrabook at an affordable price. 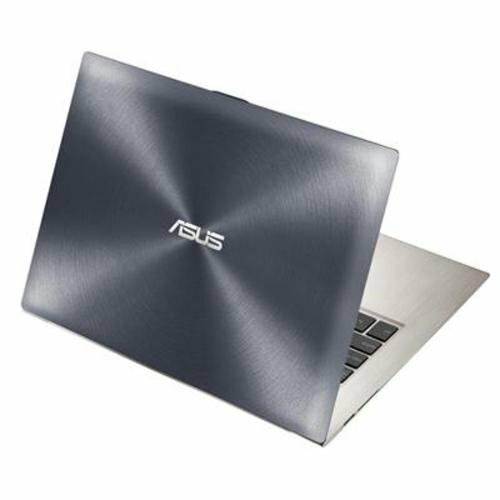 The Asus Zenbook UX32A is definitely worth considering if you're in the market for an ultrabook.